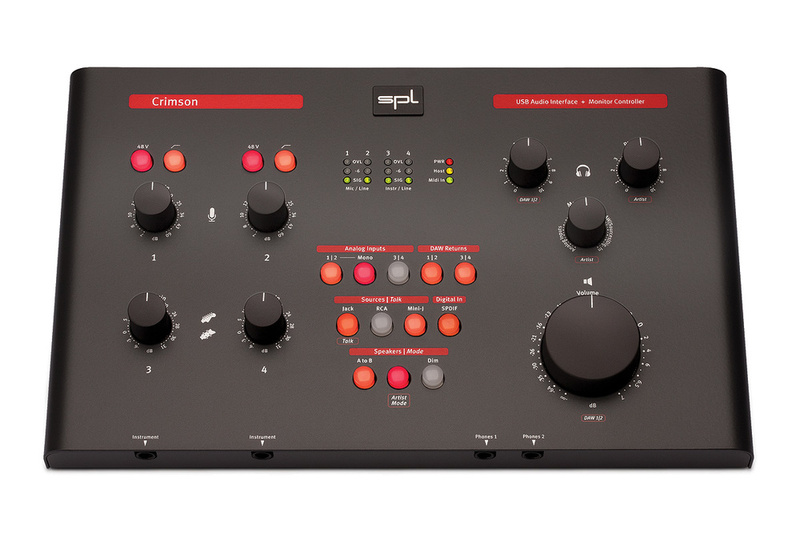 SPL's Crimson combines a high‑quality interface and monitor controller into one conveniently sized box. The German Sound Performance Lab are well known for manufacturing a range of well‑designed and high‑quality, exclusively analogue, audio equipment. The company's catalogue offers various solid‑state and valve‑based preamps, channel strips, dynamics processors (such as the excellent Transient Designer), equalisers, headphone amps and several monitor controllers — as well as some very impressive mastering console systems. Until recently, 'digital' wasn't even in SPL's lexicon, but the company now offer a 16‑channel MADI A‑D/D‑A converter called the Madison (see what they did there?) and — the subject of this review — the new Crimson, which is a six‑in, six‑out USB 2 interface combined with a high-quality monitor controller. The Crimson is a fairly large but low‑profile desktop unit, measuring 330 x 60 x 207 mm (WHD), and weighing a surprisingly heavy 2.7kg. It is powered from a universal wall‑wart with a clip‑on adapter plate to suit the local main plug style. The PSU provides 12V DC at 1.5A (the Crimson consumes around 17W of power), and DC‑DC converters inside the Crimson generate the ±17V and +48V analogue audio power rails, as well as the +5 and +3.3 V digital supplies. The unit is finished in a matte grey paint with clear white labels, some on red backgrounds, and with the rear socketry labelled — as most SPL products are — so as to be readable when leaning over from the front! Four separate analogue recording input channels are routed to the USB port. The first two comprise discrete transistor mic preamps with individually switched phantom power, high‑pass filters, and gain controls. The second two are dedicated unbalanced instrument (DI) inputs, again with their own gain controls and sockets on the front panel. Interestingly, these are always monitored in mono (ie. routed to both monitor output channels), whereas the mic inputs are routed to the left and right monitor channels by default, with a mono button to centralise Mic 1 if used on its own. All four of these input channels also have associated rear‑panel, fixed‑gain, balanced line inputs, and these take priority over theircorresponding mic and DI channels when connected. Some clever signal routing is employed so that a single line input (within each pair) is automatically monitored in mono, while an adjacent pair is treated as stereo. Additional inputs to the monitoring section comprise a stereo balanced line input on TRS jack sockets, and two stereo unbalanced line inputs on RCA‑phono and 3.5mm connectors. Although there are no facilities to trim the levels of the external sources, by default the unbalanced inputs are all raised in level to match standard professional levels. This makes comparison A/B switching and/or mixing of sources to the monitoring outputs far more practical. The RCA‑phono inputs are raised by 10dB and the mini‑jack input by 15dB, but their individual gain stages can be disabled via dip‑switches on the base panel, if required. A stereo S/PDIF digital input is also provided on an RCA‑phono socket, and this is also routed to the USB interface as the fifth and sixth recording inputs. There is no sample‑rate conversion, the internal hardware clock synchronises to the external source automatically. SPL state that the S/PDIF digital I/O is also compatible with AES3 devices, via suitable connector converters. The S/PDIF input and the DAW return channels 1/2 share the same D‑A converter, so selecting the S/PDIF input source toggles between the DAW and external digital input, for easy A/B switching. The rear panel's legending also appears upside down for the benefit of Australians, trapeze artists, bats and those craning to see over from the front panel. On the output side, the USB provides six return channels, with the first four appearing as monitor sources in two stereo pairs. Returns 5/6 are routed directly to the S/PDIF digital output. 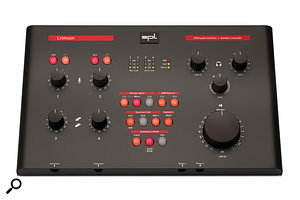 Although the Crimson doesn't provide any dedicated physical analogue outputs from the DAW, the Speaker B outputs become available to provide a separate mix for artist headphones (or to route signals via an outboard analogue processor) when the system is switched into 'Artist Mode' (see box). Under normal conditions, the main 'Speaker A' balanced outputs are via a pair of XLRs and should feed the main monitors, while a pair of TRS sockets (Speaker B) provides outputs to an alternative set of monitors. Pressing the A‑to‑B button toggles the monitoring signal between the two sets of monitors, and recessed trimmers are provided alongside the TRS sockets to adjust the level over a ±5dB range to match speaker sensitivities, if necessary. The remaining rear panel connectivity comprises the usual MIDI In and Out DIN sockets, the coaxial 12V DC power inlet, and the Type‑B USB socket. Two front-panel headphone outputs are provided with individual volume controls. Normally they both follow the selected monitoring source, but their roles change in Artist Mode. The Crimson interface can also be used in a stand‑alone condition, as a simple monitor controller and preamp. Everything works as normal, except that the entire digital side of things is disabled, so the USB, MIDI and S/PDIF connections all become non‑functional in this mode, as do the input channel overload LEDs. Unlike so many monitor controllers, the front panel of the Crimson is laid out very spaciously, with the recording input controls on the left, and the monitoring controls on the right, separated by a triangle of illuminated source selector buttons. The input gain controls range from 7 to 60dB for the mic inputs (maximum input level is +14.5dBu), and ‑6 to +31 dB for the instrument inputs (max input is +24dBu). The line input sensitivity isn't adjustable, but the maximum level is a healthy +22.5dBu,the same as the external source inputs (although the internal A‑D converters clip at +15dBu). The mic inputs are also equipped with illuminated buttons to activate 48V phantom power and high‑pass filters — although these are only first‑order (6dB/octave from 80Hz). A steeper slope is often more helpful for removing unwanted rumbles and sub‑sonics, but this option was chosen to be gentle and 'go unnoticed'. The preamp performance is very good, with an EIN figure of ‑128dB, and THD+N of 0.003 percent (at 30dB gain). Input levels for the four input channels are indicated on simple traffic‑light LED arrays in the centre of the panel, with LEDs for Signal Present (green above ‑37dBFS/‑22dBu), ‑6dBFS (yellow and +9dBu), and overload (red and +15dBu). Three more LEDs illuminate to show when the unit is powered up, connected to a USB host, and when MIDI data is being received. On the right-hand side, two rotary controls adjust the two headphone output volumes (scaled simply from zero to 10), and a very large and nicely weighted rotary control sets the loudspeaker monitoring level. A '0' reference position is marked at two o'clock, with a further 7dB of gain range above. Between these three level controls is a fourth knob marked 'Monitor Mix'. This blends or mixes between the recording inputs (mic, instrument and line) and the monitor sources (DAW returns, external sources and digital input), to provide latency‑free monitoring while tracking. When 'Artist Mode' is engaged this control only affects the Headphone 2 and Speaker B outputs. The triangle of buttons select the monitor sources, and they can all be selected at once to mix signals together, if required. The majority of buttons are orange when illuminated, but the phantom power, Artist Mode and input mono button glow red instead. The top row of buttons selects the analogue inputs and DAW returns, in channel pairs. A Mono button is provided for inputs 1/2 so that a single-mic recording can be auditioned as a dual‑mono source rather than on just one side. The middle row selects the external input sources (TRS, RCA, mini‑jack, and S/PDIF), and the external TRS input also serves as the talkback button when in Artist Mode, The bottom row switches the monitor signal from the Speaker A to Speaker B outputs, and engages a 20dB Dim option and the Artist Mode. Sadly, the Crimson doesn't include monitor output mono, polarity invert or difference signal options. As you would expect, the Crimson is very straightforward to use, and feels very solid and professional under the fingers. Its weight also helps to ensure it stays in one place on the desk! I had some minor niggles initially when installing the ASIO drivers on a Windows 7 64-bit system, but it all came good on a second attempt and I had no trouble at all with a laptop running 32-bit Vista. Unusually, a USB 2 cable is not included with the Crimson, an omission that SPL justify by suggesting most people have spare leads lying around anyway, and would probably want a different length from any that was supplied. (The maximum recommended cable length is five metres.) Leaving the cable out also helps to keep the price down, allegedly. There's no risk of cramped controls with the Crimson's 330 by 207 mm front panel. The recording inputs — both mic and instrument — are clean and quiet, with plenty of headroom (especially the instrument inputs) and sensible gain ranges. The monitoring outputs are equally well designed, with serious drive capability on the headphone outputs, happily driving my AKG K701s and Sennheiser HD25s to silly levels with ease. The Monitor Mix control proved a very useful facility, too, allowing the monitoring emphasis to be shifted between recording and replay sources. As a basic monitor controller the Crimson is a good‑sounding and competent device, with great specifications (+22.5dBu maximum output level, 115dBA dynamic range from the converters, and 0.01 percent THD+N), although the lack of mono and difference signal auditioning options — a pet hate of mine! — is a shame. To be fair, though, the Crimson does offer a great deal of very good‑sounding circuitryfor the asking price, and it has a practical number of recording inputs, without having to share mic and instrument inputs (as most interfaces do), which is a big plus in my book. The lack of direct analogue outputs from the DAW might appear restrictive compared to most computer interfaces, but because of the direct integration with the monitor controller, and the handy 'Artist Mode' option, it really isn't a handicap in practice. Talking of the Artist Mode, this provides a really neat way of setting up separate artist and engineer mixes quickly and easily. In essence, an artist cue mix of pre‑recorded tracks is set up in the DAW, routing to DAW out 3/4 which is selected on the Crimson to send it to the Artist headphones (2) and Speaker B outputs. The tracking inputs (mic, instrument and line) are also selected so the artist can hear them, and the balance between these as zero‑latency sources and the DAW cue mix is adjusted with the Monitor Mix control. The engineer monitors the complete DAW mix (including the recording channels) via DAW outputs 1/2 which are routed directly to the Speaker A and Headphone 1 outputs. With a little lateral thought — or a sneak peek at the manual — the same Artist Mode can be used to insert an analogue processor into the DAW signal path for mastering and so on. The trick is simply to connect the analogue processor between the Speaker B outputs and Line inputs 3/4. The signal to be processed is then routed out via DAW outputs 3/4, and recorded back in on channels 3/4. Simple! The fact that the Crimson can be used as a stand‑alone monitor controller, without the computer, is also very handy, although it's a shame that the S/PDIF input becomes unavailable as a monitor source. Nevertheless, the stand‑alone mode makes it possible to audition external sources — for recreational music listening, for example — or to play instruments against them, without having to fire up the computer first. I like that a lot! For a home project studio — whether for a single user application, or for someone wanting to record a few musicians simultaneously — the Crimson offers a very attractive and remarkably well‑priced solution, and is certainly worth serious consideration for anyone thinking of investing in a new interface. If the Crimson is switched to 'Artist Mode' via a button near the bottom of the front panel, the Speaker B and Headphone 2 outputs are switched to provide a dedicated artist cue mix, and an external talkback input signal can be routed to the artist cue mix, too. For a single artist, the front panel Headphone 2 socket will suffice, but where you are recording multiple musicians, an external headphone amplifier system can be connected to the Speaker B outputs as well. In Artist Mode, the Speaker A and Headphone 1 outputs are fixed to monitor just the DAW 1/2 return channels. The speaker mode A‑to‑B button can be used to route this DAW mix to the artist, if necessary. Meanwhile, all of the other monitoring buttons and mix controls can be used to build the cue mix for the artist. A line‑level talkback signal can be connected via the left channel of the external TRS source input, and the Jack Source monitor button then becomes the talkback button, routing the signal directly to the Speaker B and headphone 2 outputs. Speaker A is dimmed automatically to make speech more audible and to avoid howlrounds. Alternatively, one of the integrated mic inputs can be used as the talkback mic, switched via its monitor button or simply by turning the gain control up and down! USB 2 was chosen for the Crimson interface because of the high reliability of drivers, and the fact that USB 3 is backward compatible, ensuring longevity. The interface is Apple Class‑2 compliant (asynchronous mode), and so can be used 'driver‑less' with an iPad via Apple's Camera Kit Adapter, although the highest supported sample rate in this mode is 96kHz. For normal Mac and Windows operation, though, the appropriate dedicated drivers — which can be downloaded from the SPL web site — will be installed, allowing sample rate support up to 192kHz. The latest file versions at the time of writing are 3.01 for OS X, 2.2.7 for iOS and 2.9.60 for Windows (XP, Vista, 7 and 8, 32- and 64-bit). Two drivers are available for Mavericks (OS 10.9), too. A 'Bit Accurate' driver (an ASIO‑like HAL driver) is available that bypasses Core Audio to provide a more accurate and faster interface, and this is recommended for use with Pro Tools, Cubase, Nuendo, Ableton Live, and most other DAWs. However, this driver doesn't support system audio input and output, so where system audio is required, a standard Core Audio driver is also available, and can be accessed through the host program's Audio MIDI Setup. ASIO and WDM drivers are provided for Windows, and work with everything from XP onwards, in both 32- and 64-bit operating systems. I installed the Crimson on a Windows 7 64-bit computer. The driver automatically slaves the computer to the hardware clock to minimise jitter, and the default 'normal' system performance latency is 392 samples (8ms) on the input and 1151 samples (26ms) on the output, but other options (relaxed, relaxed normal, normal, fast, rapid and high‑speed) offer latency ranges from 26/46ms down to 4/5ms (I/O latencies, respectively). Should system firmware updates prove necessary, they can be performed via the USB connection. SPL's high audio quality and engineering excellence. Clever and versatile integration of interface and monitor controller. Ability to record two mics and two instruments simultaneously. Zero‑latency and independent artist cue monitoring facilities. S/PDIF input unavailable when in stand‑alone mode. No mono or difference signal monitoring. An elegant USB 2 interface, cleverly integrated with a versatile monitor controller, and all with SPL's high‑quality audio and superb engineering. Quad‑core Q6700 processor 2.66GHz PC with 8GB RAM. Windows 7 Pro 64-bit (SP1).